Last week I talked about dating your children. This week I need to tell you all about the date that went horribly wrong. 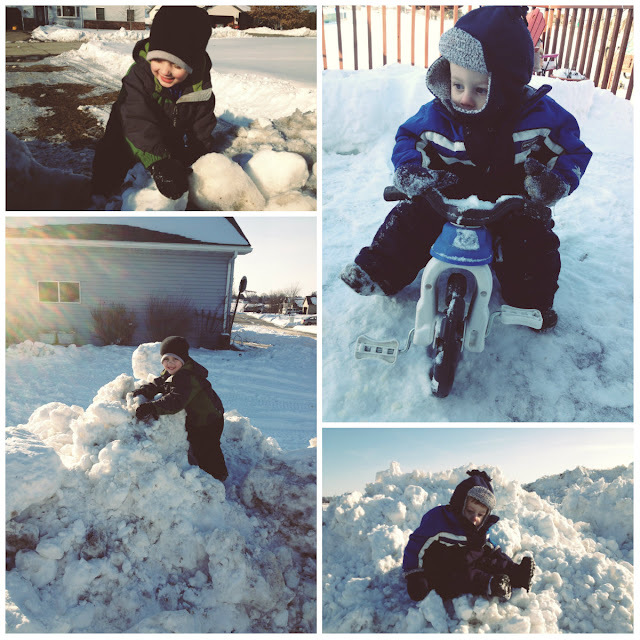 The idea to take Spencer on a movie date was spurred while I was crawling around on my knees pushing a Finn McMissile car. But I'll need to back up to a day back in January for this to make sense. You see, Spencer has major issues pooping on the potty. He just won't do it. We've tried all sorts of bribery, punishment, encouragement, reward systems, sticker charts, you name it. The kid simply prefers to do his business in his undies. One day in January after cleaning a bazillion pair of soiled undies, I got desperate and made yet another sticker chart. 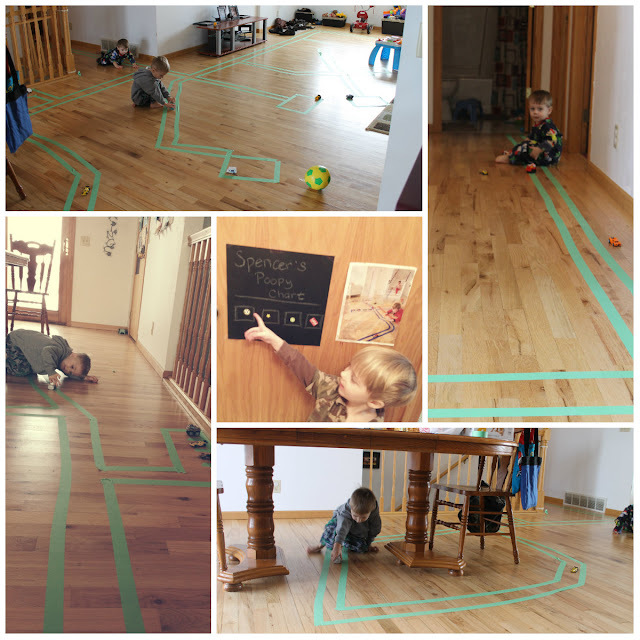 The prize was to create an extensive road system on our floor using painter's tape. Well, fast forward a handful of weeks and Spencer finally put the fourth and final sticker on the chart. Now don't get too excited. He came by those reward stickers loosely, not so much for actually pooping in the potty. We rewarded effort and accidental poops, too. So, finally, he got to make the coveted tape road. This brings us back to my brilliant date idea while crawling around on my knees pushing a car. You see, the road system has random squares at the end of some roads, their identity to be determined on a whim. One such square became a movie theater while Finn McMissile and Space Mater were traveling the roads one afternoon. A light went on above my head--a movie! That'd be a great date with Spencer! I checked the movies online and talked to Dave and we decided he'd also take Ashton on a date Saturday night, too. Saturday afternoon rolls around. I get all pretty for my date. We park the van at a spot halfway between the restaurant and the theater, and then we book it through the drizzle. We eat an early supper at a sandwich joint, and I savor my son. Seems lifetimes ago that he was my little baby. Now at 3 1/2 years old, he's a little man. After eating, we walk hand-in-hand to the movie theater, hiding from the rain under the canopies of the downtown businesses. I scan the board for the movie, but I can't remember the name of it. I choose one that sounds like a kid's movie and buy two tickets, except the matinee started at 4:10, not 4:45 like I found online. We quickly get our kid snack boxes overflowing with popcorn, a fruit snack and icees, and then sneak into the darkened theater. This is where it goes horribly wrong. You see, Jack the Giant Slayer is most definitely not an animated movie. Oh no, it is a PG13 movie, most certainly not appropriate for my preschooler. We walk back out of the theater and I explain the mishap with a gentleman who works at the theater. Surely, he's containing his laughter, but he politely refunds me my money. (It must be noted: Why on earth did he sell me a ticket to a PG13 movie for my three-year-old son without at least questioning whether I had the right movie?) Spencer takes the disappointment in stride, and we walk back to the van through the rain, carrying our expensive theater treats. We crash Dave and Ashton's pizza date before going to the video store to rent a movie. We continue our date at home under a blanket, munching on popcorn and slurping icees. Top left: posing before leaving the house. Bottom left: eating at the restaurant. Right: finally our movie date at home on our couch. So maybe the date didn't go exactly as planned, but Spencer told me his favorite part was watching the movie in our pretend theater. I guess things don't need to be perfect. Memories are memories. 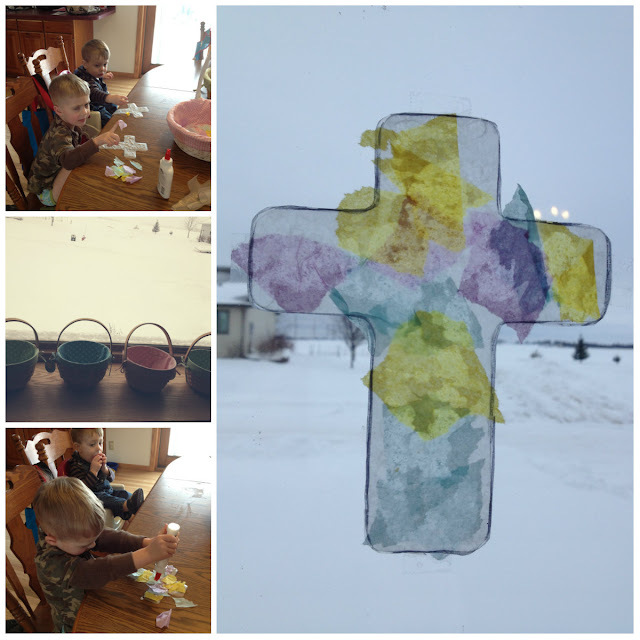 This week we attempted to catch the Spring Fever bug by bringing out the Easter decorations and doing our first Easter project, but the latest snow made it hard to live in that make believe world. 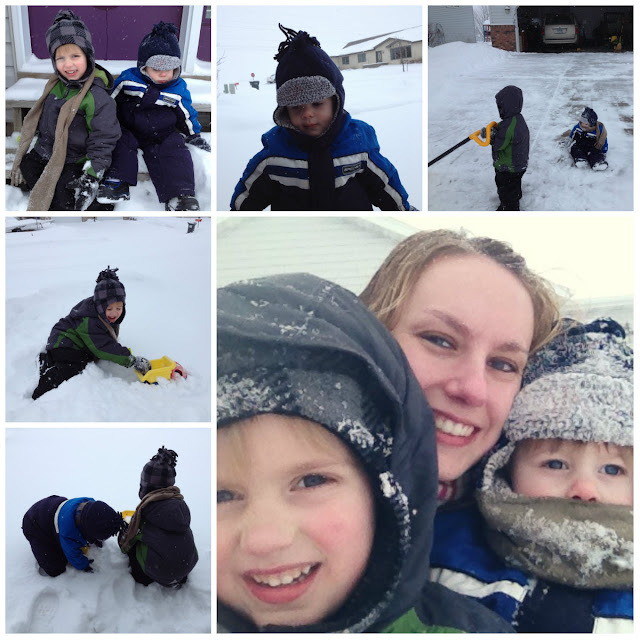 Instead, we celebrated our extended winter and played outside. Our normally scheduled Friday morning class was cancelled this week, so we finally made it to the local toy store's monthly Happy Friday program. The toy store has a separate wing with a train table, kitchen set, dolls, and other miscellaneous toys for children to play with. This is where the once-a-month program takes place. They sing songs led by guitar, read stories, do felt board activities, all the while engaging the audience. Then everyone marches to the other end of the store for a free carousel ride while singing The Ants Go Marching. 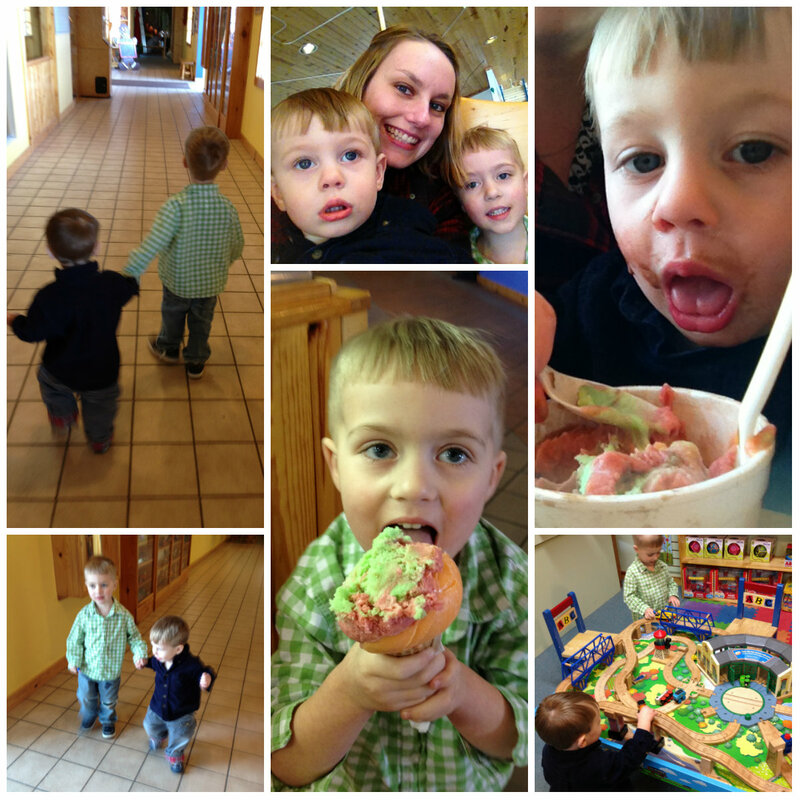 After our carousel ride, we got some ice cream and then spent a long time playing with the toys. Last Sunday Spencer sang at church with the rest of the kids in Sunday School. I had my phone ready to record him in action, and coincidentally caught his big show. Now I understand it isn't PC to laugh at your kid getting hurt, so I'll preface it by saying he was just fine, didn't even need a baindaid. Feel free to laugh, and then watch it again and laugh some more. I have! 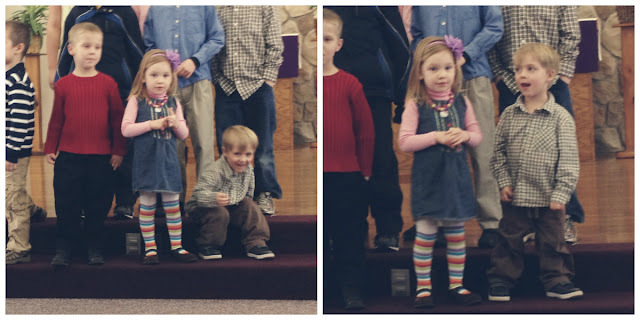 During our weekly Sunday dinner visit at the in-laws last week, my gracious mother-in-law suggested we leave the kids with them and enjoy a few blessed moments to ourselves. We took a Kubota ride up the hill to feed the deer. The 30 minute affair felt like a mini vacation! Enjoying the chalkboard I made at our first monthly MomMe time we attended on Monday, which is a new group that meets at a church once a month for moms to get together with other moms while the kids play and do crafts downstairs. I can't help but savor the moments my little man naps on me. 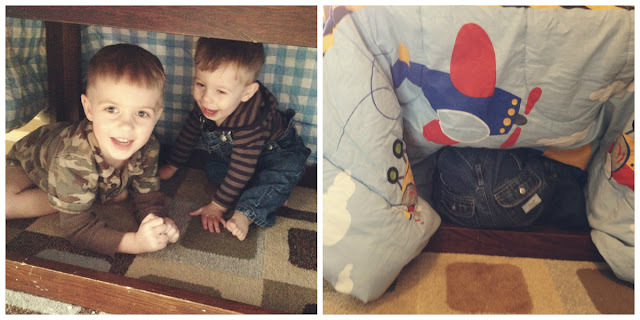 Now that Ash has given up his morning nap, we can actually leave the house while Spencer is at preschool. Thursday we had a mini date at the Target cafe. 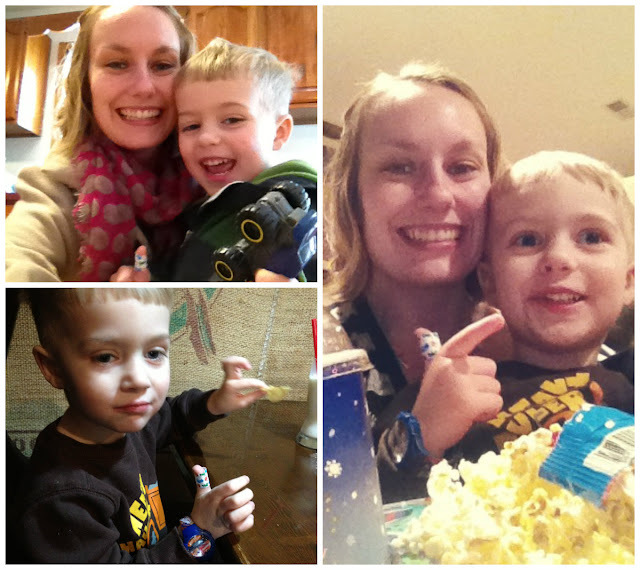 Spencer thinks he needs a baindaid for teeny tiny owies, and then thinks he can't actually use the finger wrapped in the bandaid. Who says grilling burgers is only a summer past time? Tigger is a Big Brother substitute while Spenc is at Sunday School. We're all dying for Spring!! Top right corner: a spaceship made from a broken doll house being supported by chairs. 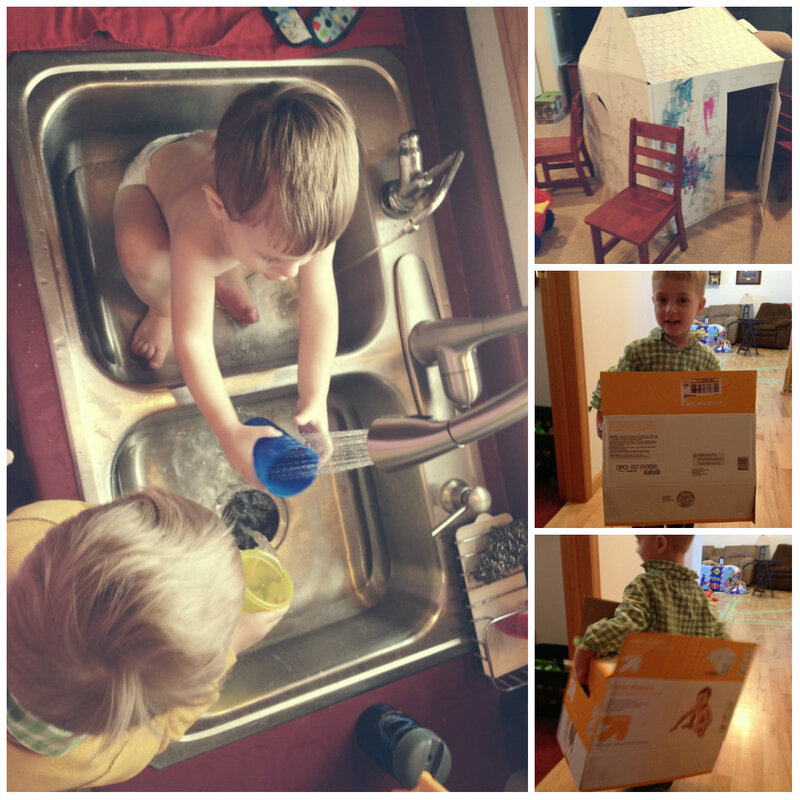 Bottom and middle right corner: a rocket like Rolie Polie Olie's made from a diaper box. The latest in my etsy shop, Baby and You Handmade. 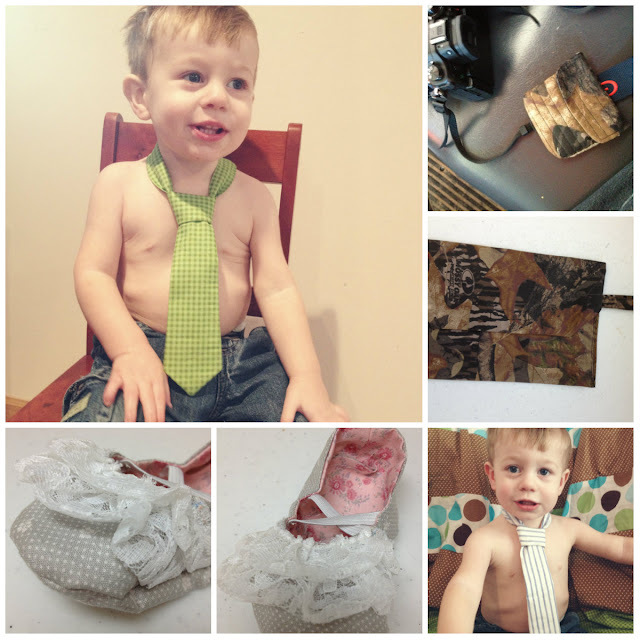 Top left and bottom right: Ashton posing with the newest addition soon to hit my shop: ties! Top right: custom camera lens pouch made for a friend. Middle right: the manly diaper clutch I made for my husband because he didn't enjoy carrying around my paisley one. Bottom left and middle: newest baby shoes have lace ruffles, also coming soon to my shop.